January 20, 2012 The U.S. Energy Information Administration (EIA)-The Arctic holds an estimated 13% (90 billion barrels) of the world's undiscovered conventional oil resources and 30% of its undiscovered conventional natural gas resources, according to an assessment conducted by the U.S. Geological Survey (USGS). Consideration of these resources as commercially viable is relatively recent despite the size of the Arctic's resources due to the difficulty and cost in developing Arctic oil and natural gas deposits. Studies on the economics of onshore oil and natural gas projects in Arctic Alaska estimate costs to develop reserves in the region can be 50-100% more than similar projects undertaken in Texas. •Equipment needs to be specially designed to withstand the frigid temperatures. •On Arctic lands, poor soil conditions can require additional site preparation to prevent equipment and structures from sinking. •Long supply lines and limited transportation access from the world's manufacturing centers require equipment redundancy and a larger inventory of spare parts to ensure reliability, while increasing transportation costs. •Employees expect higher wages and salaries to work in the isolated and inhospitable Arctic. •Natural gas hydrates can pose operational problems for drilling wells in both onshore and offshore Arctic areas. Natural gas development could be especially challenging. Although the Arctic is rich in natural gas, the development of Arctic natural gas resources could be impeded by the low market value of natural gas relative to that of oil. Furthermore, natural gas consumers live far from the region, and transportation costs of natural gas are higher than those for oil and natural gas liquids. Overlapping and disputed claims of economic sovereignty between neighboring jurisdictions also could be an obstacle to developing Arctic resources. 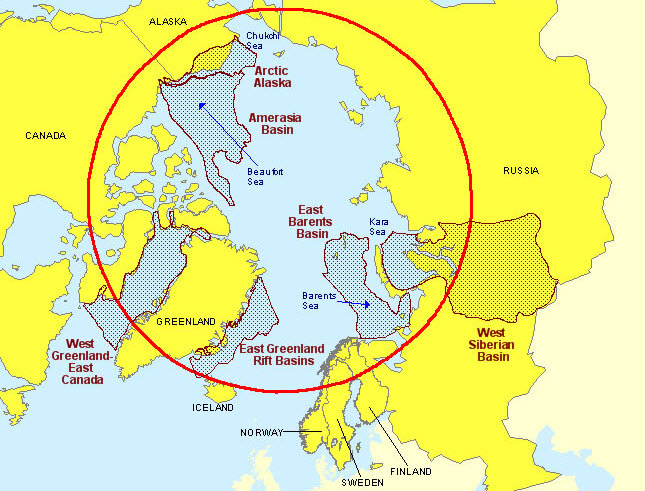 The area north of the Arctic Circle is apportioned among eight countries—Canada, Denmark (Greenland), Finland, Iceland, Norway, Russia, Sweden, and the United States. Under current international practice, countries have exclusive rights to seabed resources up to 200 miles beyond their coast, an area called an Exclusive Economic Zone (EEZ). Beyond the EEZ, assessments of "natural prolongation" of the continental shelf may influence countries' seabed boundaries. Along with economic and political challenges, environmental stewardship and regulatory permitting may also affect timelines for exploration and production of Arctic resources. Environmental issues include the preservation of animal and plant species unique to the Arctic, particularly tundra vegetation, caribou, polar bears, seals, whales, and other sea life. The adequacy of existing technology to manage offshore oil spills in an arctic environment is another unique challenge. Spills among ice floes can be much more difficult to contain and clean up than spills in open waters.